Seaweed is a term applied to multicellular, marine algae which are large enough to be seen by the eye unaided. Some can grow to up to 60 metres in length. Seaweeds include members of the red, brown and green algae. They are members of the kingdom Protista meaning they are not Plants. They do not have the vascular system (internal transport system) of plants and do not have roots, stems, leaves and flowers or cones. Like plants they use the pigment chlorophyll for photosynthesis but also contain other pigments which may be coloured red, blue, brown or gold. Blue-green algae are not marine algae. They are in a group called cyanobacteria and are more closely related to bacteria. Some cyanobacteria form brown, green, red or purple tufts on coral reefs. To survive seaweeds need salty or brackish water, sunlight and a surface to attach themselves to. Because of these factors they are generally found in the littoral zone (this includes the intertidal zone but generally extends out much further). They are usually found on rocky rather than on sand or shingle shores. Seaweeds are a food source for marine animals such as sea urchins and fishes, and are the base of some marine food webs. They also provide shelter and a home for numerous fishes, invertebrates, birds and mammals. The kelps form dense forests which support entire underwater communities providing both food and shelter. Intertidal seaweeds can be exposed to many environmental stresses including drying out when not under water, temperature and salinity changes and wave action. Thallus: the entire body of a seaweed. Lamina: a flattened structure that is resembles a leaf. Sorus: a cluster of spores spore. Air bladders: a hollow, gas-filled structure organ which helps the seaweed float, found on the blade). Other seaweeds (e.g. kelp) have floats which are located between the lamina and stipe. Stipe: a stem-like structure, not all seaweeds have these. 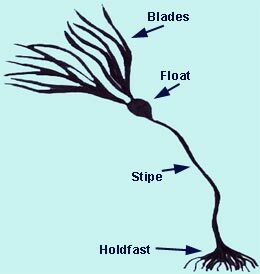 Holdfast: a specialized structure on the base of a seaweed which acts as an “anchor” allowing it to attach to a surface (e.g. a rock). Haptera: finger-like extensions of holdfast anchoring to benthic substrate. Seaweeds play a very important roles in many marine communities. They are a food source for many marine animals such as sea urchins and fishes, and form the base of some food webs. They also provide shelter and a home for numerous fishes, invertebrates, birds, and mammals. Seaweed life and reproductive cycles can be quite complicated. Some seaweeds are perennial, living for many years, while are annuals. Annual seaweeds generally begin to grow in the spring, and continue throughout the summer. 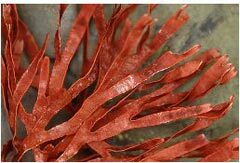 Some red seaweeds have a life span of 6 to 10 years. Seaweeds can reproduce sexually, by the joining of specialized male and female reproductive cells, called gametes. After they are released from the sporophyte, the spores settle and grow into male and female plants called gametophytes. 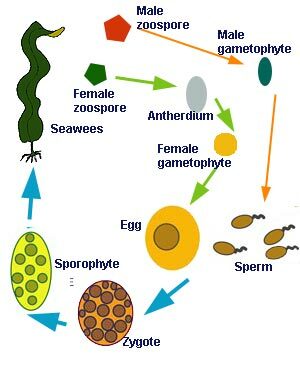 The gametophytes produce gametes (sperm or eggs). The sperm and eggs are either retained within the gametophyte plant body, or released into the water. Eggs are fertilized when the sperm and egg fuse together, and a zygote is formed. Zygotes develop and grow into sporophytes, and the life cycle continues. Seaweeds display a variety of different reproductive and life cycles and the description above is only a general example of one type, called alternation of generations. In a few species there is an alternating sexual and asexual reproductive process with every generation. Seaweeds can also reproduce asexually through fragmentation or division. This occurs when parts of a plant break off and develop directly into new individuals. All offspring resulting from asexual reproduction are clones; they are genetically identical to each other and the parent seaweed. Seaweeds area food source for humans especially in East Asia, it is most commonly associated with Japanese food. 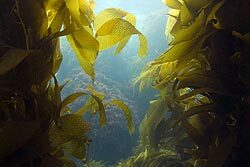 Seaweeds also are used to make a number of food additives such as alginates and carrageenan which is used in cooking and baking as a vegetarian alternative to gelatine. Many seaweeds are used as medicine. Alginates are used in wound dressings and in the production of dental moulds and agar is used very widely in Microbiology to help grow bacterial cultures. Seaweeds are ingredients in toothpaste, cosmetics and paints and are used in industrial products such as paper coatings, adhesives, dyes, gels, explosives and many more. Much of the oil and natural gas we use today formed from seaweeds which partially decomposed on the sea floor many millions of years ago. as he discusses the important roles algae have played in the development of life as we know it.